This Easy Cherry Almond Coffee Cake is gluten free and quick to make. Just 10 minutes to whip it up and 35 minutes to bake. Eat it warm or at room temperature. 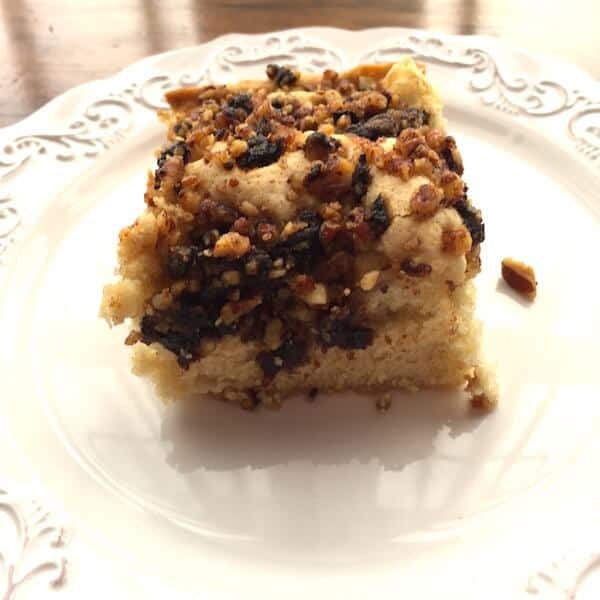 This Cherry Almond Coffee Cake is gluten free and topped with pecans. Hi. It’s Lois at Recipe Idea Shop, telling you about a scrumptious and easy Cherry Almond Coffee Cake (Gluten Free) that I made one Sunday morning. I wanted to bring a snack to Quaker Meeting and decided to modify my Snickerdoodle Coffee Cake recipe to jazz it up a bit. And the result was stupendous. It’s pretty simple to make. The only trick with gluten free cakes and breads is that they need eggs (or something) to bind them together, and the batter needs to be whipped on high speed for a couple of minutes to whip some air into it and lighten it up a bit. When I want to make a cake with a hearty topping like this one, I bake the cake for a little while—in this case, 10 minutes—before adding the topping. Otherwise the topping will sink to the bottom and it won’t be as pretty. Of course, it will still taste super good. Organic Almond Extract. Buy it on Amazon today. The combination of sweetness, almond extract flavoring, and tart cherries was so good. I could sit down and eat the whole cake. Luckily, others at Meeting helped me. They ate more than half. So I only have a few more pieces to go until I eat it all up. Sweet and tangy, an excellent treat anytime. Mix the sugar, eggs, almond milk, and canola oil until thoroughly combined. Add the flour, salt, and baking powder on top of the previous ingredients. Give these dry ingredients a little stir to combine them, and then mix with the wet ingredients until combined. Whip on high speed for 2-3 minutes. Pour the batter into a greased 8” x 10” cake pan. Bake 10 minutes at 350F degrees. While the cake is baking, in a small food processor, chop the cherries and pecans. Add the canola oil and brown sugar and mix until combined. Sprinkle the cherry-nut mixture over the top of the cake, and return it to the oven to bake another 25 minutes or so, until a toothpick inserted comes out clean. 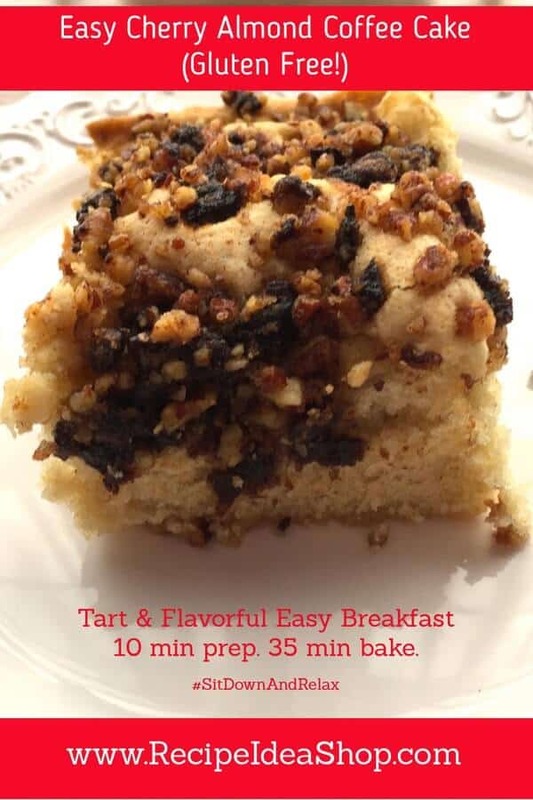 Easy Cherry Almond Coffee Cake Nutrition Label. Each serving is about 2″ x 2″ or 1/24 of the cake.